Music is the most important factor to any party or function, and we have a 100% positive feed back on our Jukeboxes. Customers who have hired our Jukeboxes have told us that the party would not have been such a success without our Jukebox and the music variety. Our Jukeboxes are the ultimate, state of the art and extremely easy to use, with no instruction manual needed. A 19″Digital touchscreen that will work even if you have long finger nails, no buttons to get confused with, and video clips free. The Smart Feature. Our jukeboxes will start playing in random mode as soon as you turn them on. They can be set to play country, 70s, 80s, 90s, chart hits, rock even top 20 great for the start of your function when everyone is arriving so you don’t need to load the jukebox with songs. As soon as a song is selected the smart mode will turn off and the selected song or songs will play. Later in the night after everyone’s selection has played the smart mode will turn on and the jukebox will choose a song from it’s selection. This is very important for any function as the jukebox will never stop playing. A normal jukebox will stop playing until a selection is made. Also with a advanced search feature you can type in the song or artist and be directed straight to your song, no need to scroll through 100’s of songs to get to your selection. With music from 50’s to the latest top 20, there is something for everyone, and ipod compatible. Greek, Italian and Croatian music available. 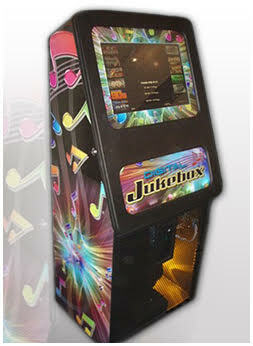 The jukebox can be ordered with a remote control so only the hirer can skip songs or turn the volume up or down. Every Jukebox comes with a free terminator effect light that is sound activated (Moves to the beat of music) A microphone is also supplied for speeches or just to sing along to your favourite song. All this and they are realistically priced and look and sound great. If you have your own big screen tv or projector we can connect it to the Jukebox for the video clips. OR THE WHOLE ROOM WITH EVERY JUKEBOX HIRE.